John Henry Keating’s parting wish as he left the Federal Parliament after twenty-two years was that the Senate would ‘fulfil the functions which the founders of the Constitution fondly believed it would fulfil when they gave it its Constitution’. At twenty-nine, Keating had been the youngest member of the first Commonwealth Parliament. According to Punch, in 1906 he was a ‘tall, plump, youthful looking man with curly locks … [on] the surface he is an unemotional man. His voice is soft-purring; his manner is smooth—oily; his style is sleek—slim. He does not make many enemies’. This was probably just as well, for his early career had coincided with a period in federal politics that was characterised by shifting alliances between the Protectionists, the Free Traders and the fledgling Labor Party. John Henry Keating was born in Hobart on 28 June 1872, the son of James Keating and Mary, née Cronley. His father was a carpenter and furniture maker. He was educated at Officer College, Hobart, and St Ignatius’ College, Riverview, Sydney. He obtained an associate of arts degree from the Tasmanian Council of Education (1890) and in 1894 was called to the Tasmanian Bar. In 1896, he was one of the first two graduates in law at the University of Tasmania. Keating practised in Lefroy and Launceston, and later in Victoria where in 1918 he was admitted to the Bar. He maintained a strong interest in constitutional law throughout his life. His bound copy of the Commonwealth Constitution displays a close annotation of cases which relate to particular sections. In 1914, Keating unsuccessfully moved in the Senate that an elected constitutional convention be summoned to consider amending section 51 of the Australian Constitution. Such a convention, he said, would enable changes to be considered on ‘a popular, not a parliamentary, basis’. Keating became an enthusiastic supporter of the Federation movement in Tasmania (in 1899 he wrote that during the campaign he ‘never left the office before midnight’). He was influenced by Andrew Inglis Clark, who was Tasmania’s leading delegate to the Australasian Federation Conference in 1890 and to the National Australasian Convention in 1891. Keating and Herbert Nicholls (son of the editor of the Hobart Mercury, H. R. Nicholls, whose paper opposed Federation) were members of a group of eminent Tasmanians who became known as ‘Clark’s Boys’. The ‘boys’ included also John Earle and Edward Mulcahy. Keating was prominent in the Australian Natives’ Association, becoming president in 1895. Later he was secretary and organiser of the Northern Tasmanian Federation League. It was through these organisations that he advanced the cause of Federation. When Clark abstained from supporting the federal cause prior to the 1898 Federation referendum (due to concerns about compensation for Tasmania which would result from the proposed ending of customs duties), it was left to Keating and Nicholls to press the pro-Federation case in Tasmania. In 1900, Keating was an unsuccessful candidate for George Town as an Independent for the House of Assembly elections. The next year, he topped the poll for the Senate election and entered the first Federal Parliament as one of the two Protectionist senators from Tasmania. He was further honoured by being made Government Whip in the Senate by the Barton and first Deakin administrations. In 1909, he wrote wearily to Alfred Deakin of the hard work of the first two parliaments, adding that he had ‘crowded in more than 3 years Whipping’. Keating was involved with some of the foundational legislation of the Commonwealth. His first major speech in the Senate was during the Address-in-Reply to the Governor-General, Lord Hopetoun, when he referred to issues that were to become consistent themes throughout his time in the Senate. He touched on matters such as the establishment of the Commonwealth public service, the High Court and the federal capital. During debate on the Immigration Restriction Bill, he stated his belief in the maintenance of a White Australia policy. (In 1924, he would write articles in the Launceston Examiner published under the title ‘White Australia: men and measures in its making’). During debate on the Commonwealth’s first Electoral Bill, Keating, influenced by his knowledge of the working of proportional representation in Tasmania, argued for the adoption of the ‘Hare-Spence system of voting’. Another issue that early caught his attention was communication between Tasmania and mainland Australia. Indeed, he proposed that a royal commission be formed to investigate the matter. Instead, the Senate established a select committee, which Keating then chaired. (This was the first select committee of the Senate—and of the Parliament.) He would continue to argue for improved services to his state until his last months in the Parliament when, protesting against the provisions of the Navigation Act, he commented: ‘We hold communication with our sister States by very uncertain strings’. In July 1905, Keating was made Honorary Minister in the second Deakin administration, a position he held until October 1906. He then became Vice-President of the Executive Council (until February 1907) and Minister for Home Affairs (January 1907–November 1908). On joining the Ministry, he wrote to Andrew Inglis Clark that he would ‘do [his] very best’ to gain the respect of the Senate and the public. In 1907, he introduced the Quarantine Bill which ‘called for the fullest powers … in relation to maritime quarantine, and … to what may be called Inter-State quarantine’. With amendments, the legislation gained assent the following year. He continued to emphasise what he described as the importance of ‘the co-operation and harmonious working of the States to secure the end which they have had in view in the past’. He was responsible for drafting the Copyright Billand during debate gave a detailed account of the history and law of copyright. He later confessed that he had been unable to put the Bill down, staying up ‘unduly late so interested I was’. As Minister for Home Affairs, he had carriage of the Bounties Bill, whereby the Commonwealth set up the scheme of assisting new and already established industries. In July 1907, he resubmitted to the Senate the Parliamentary Witnesses Bill. The Bill was passed in the Senate after a short debate although it was to languish on the House of Representatives Notice Paper until Parliament was prorogued on 12 June 1908. Keating was responsible also for the production of the first Commonwealth Official Year Book, published in 1908. With the demise of Deakin’s Government in November 1908, Keating returned to the backbench where he remained an active member of Senate committees. He would continue to relish debate on the detail of legislation, acknowledging on one occasion how much he enjoyed the committee stages of a bill. In 1908, he was in charge of arrangements for the visit to Australia of the American Great White Fleet. The following year, he was nominated as a representative to the Imperial Defence Conference, though the conference report makes no mention of his participation.Keating was a supporter of Australia’s involvement in World War I and visited the Western Front in 1916 as a representative of the Empire Parliamentary Association. From these years on, his speeches in the Senate indicate an increasing interest in defence. In 1924, he was appointed Officier de l’Instruction Publique, Palmes Universitaires, by the French Government in recognition of services rendered during World War I. In 1913, Keating had joined the ‘Liberal Party’, which had emerged from the fusion of the Deakin Protectionists and the Anti-Socialists and which, after the 1916 Labor split over conscription, would become part of W. M. Hughes’ Nationalist Party. It was now that Keating, along with other Tasmanian senators, was involved in one of the most curious events in the Senate’s history. Following the formation of the Nationalist Government on 17 February 1917, Hughes attempted to push through the Parliament a resolution to procure an imperial Act to extend the Government’s term until six months after the end of the war. The resolution passed the House of Representatives, but faced certain defeat in the Labor-dominated Senate. Hughes attempted to rectify this situation by votes ‘proffered, bought or borrowed from Tasmania’. Subsequent events centred on the absence of Tasmanian Labor senators Guy, Long and, in particular, Ready. It was Ready’s sudden illness, and even more sudden resignation from the Senate, that led to the speedy appointment on 2 March 1917 of the compliant John Earle to a casual vacancy and thereby to the Hughes camp. It now looked as if Hughes had the necessary numbers in the Senate. But the Prime Minister had reckoned without two Tasmanian Nationalists, namely Keating and Bakhap. Keating now came to Ready’s aid. He denied Ready had feigned illness. ‘I saw [him]’, Keating said ‘on the boat [crossing Bass Strait]. I saw him again here in Parliament House before I left to attend a meeting of the Public Works Committee … I saw him again at luncheon time, and noted how ill the man looked’. Keating then gave a graphic account of what had occurred in the Parliamentary Dining Room: ‘All of a sudden I heard the very crash which indicated his collapse … I saw the man lying on the floor in a cold perspiration’. In response to a disbelieving comment by Senator Lynch, Keating described how honourable senators clustered about the prostrate Ready with such comments as ‘loosen his collar’, ‘open the window’ and ‘give him a drop of brandy’. He concluded: ‘There could be no doubt whatever as to the genuineness of the fit’. He referred to the strain imposed by ‘rushing back and forward over the strait to Tasmania’ and to Ready being ‘a colleague’ of his own state and a man he was ‘expecting to fight at the next election’. He attributed Ready’s illness and resignation to the bitterness of the conscription debate in Tasmania and in the Senate. Keating then joined with Senator Bakhap in refusing to support the Senate resolution, and voted for the motion on 13 March for a royal commission into the whole business (which in the end did not take place). With the desertion of Keating and Bakhap, Hughes’ scheme crumbled and he was forced to go to the polls. Keating showed an ongoing concern with the growth of executive power. In debate in August 1915 on the War Precautions Bill, whichdelegated wide powers to the executive for ‘securing’ public safety and defence, he had observed that, although a ‘very small measure’ in size, the Bill was ‘not exceeded by any … to which this Parliament has given consideration’. He was particularly worried about the reachof its provisions, which he said could affect the personal liberty of ‘any member of the community’. In 1919, he referred to the Treaty of Peace (Germany) Bill as ‘a blank cheque in the fullest sense of the term’, which allowed the executive to ‘legislate by regulation’. In 1921, Keating objected to the fact that, during the lunch adjournment, an informal joint committee to consider the question of uniformity of salaries between the Clerks of the two Houses had been formed. President Givens agreed that such a committee had no official status because it was appointed at the request of the Government. 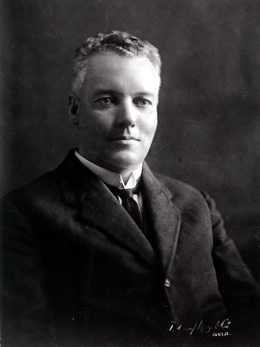 Keating was defeated at the 1922 federal election. Throughout his career in the Federal Parliament, he remained a staunch champion of the Senate’s constitutional role as the States’ House. Before leaving the Senate, he had returned to the need for a constitutional convention, which would be free of ‘party colour’. Much earlier, he had opposed premiers’ conferences, ‘a body unknown to the Federal Constitution’, as ignoring the Senate’s constitutional position. He said that he resented ‘any action calculated to undermine the position of this branch of the Commonwealth Legislature’. Keating remained active as a government legal adviser until shortly before his death. In 1932–33, he was counsel assisting the royal commission on performing rights. In 1934, with William Somerville (a member of the Arbitration Court of Western Australia), D. J. Gilbert (a Perth journalist) and Sir Robert Garran, he was appointed by Prime Minister Lyons to prepare the ‘no’ case against the secessionist movement in Western Australia. As an acknowledged authority on constitutional law, Keating was responsible, in 1936, for the production of the reprint of Butterworth’s Tasmanian Statutes 1826–1936. He was a cultured man with an abiding interest in literature and the arts (including photography and sketching). He was also proficient in French. Perhaps in keeping with his literary interests, he was a founding member of the Senate standing committee on the parliamentary library, serving until 1922. He enjoyed a personal, as well as a political, association with prominent and like-minded parliamentarians of the time such as Edmund Barton, Deakin and John Forrest, and Senators O’Connor and Symon. In Melbourne, on 17 January 1906, Keating had married at St Mary’s, St Kilda, Sarah Alice (Lallie) Monks of Launceston. Sarah, described on her marriage certificate as a lady, was an active social worker, an accomplished pianist and the author of a travel book on Queensland. The couple had two children, John Deakin and Tulla Marie; the latter became a vice-president of the Australian Journalists’ Association. In writing to Symon in 1932, Keating spoke of his pride in Tulla’s achievements and the fact that she was the first woman to work in an editorial capacity on the Melbourne Herald. Keating died in Melbourne on 31 October 1940 and a mass was offered for him at the Church of St Thomas Aquinas, Bromby Street, South Yarra. The funeral was held at Hobart’s Cornelian Bay Cemetery, where he was buried in the family vault. His children survived him, but his wife had died the previous year. The Prime Minister, R. G. Menzies, said that Keating had been regarded as ‘one of the most brilliant speakers in Australia’. The Mercury commented sadly that history had ‘yet to record the depth of his influence on his times’. CPD, 29 June 1923, p. 515. Table Talk (Melbourne), 18 April 1901, p. 15; Punch (Melbourne), 5 April 1906, p. 480. Argus (Melbourne), 1 November 1940, p. 2; J. H. Keating, Reasons for a Constitutional Convention: The Case Stated by Senator Keating, an Echo of Twelve Years Ago … 1926, Pam., NLA; Keating’s copy of the Constitution is in the Keating Papers, MS 1790, NLA; CPD, 26 November 1914, pp. 1078, 1084. Peter Henry Macfie, ‘ “Young Hopeful Men”: Henry Hector McFie 1869–1957’, THRAPP, vol. 45, no. 2, June 1998, p. 81; H. Reynolds, ‘Clark, Andrew Inglis’, ADB, vol. 3; John Reynolds, ‘The Clarks of “Rosebank” ’, THRAPP, vol. 4, no. 1, January 1955, p. 11. John Craig, ‘Tasmania and the Federal Movement’, THRAPP, vol. 22, no. 1, March 1975; John Reynolds, Edmund Barton, A & R, Sydney, 1948, p. 147;Mercury (Hobart), 26 July 1899, p. 3; Marcus Haward and James Warden (eds), An Australian Democrat: The Life, Work and Consequences of Andrew Inglis Clark, Centre for Tasmanian Historical Studies, University of Tasmania, Hobart, 1995, pp. 92–93, 106; Examiner (Launceston), 6 March 1901, p. 3; Letter, Keating to Alfred Deakin, 8 June 1909, Deakin Papers, MS 1540/15/882, NLA. CPD, 21 May 1901, pp. 43–48, 5 December 1901, pp. 8309, 8313–8314; Examiner (Launceston), 13 February 1924, p. 7, 16 February 1924, p. 3, 20 February 1924, p. 10; John Henry Keating, White Australia: Men and Measures in its Making, Launceston, 1924; CPD, 27 February 1902, pp. 10431, 10437, 10441; G. S. Reid and Martyn Forrest, Australia’s Commonwealth Parliament 1901–1988, MUP, Carlton, Vic., 1989, pp. 104, 118; CPP, Report of the select committee on steam-ship communication between Tasmania and mainland Australia, 1901–02; CPD, 26 July 1901, pp. 3107, 3127; Lloyd Robson, A History of Tasmania: Volume II, Colony and State from 1856 to the 1980s, OUP, Melbourne, 1991, p. 397; CPD, 13 September 1922, p. 2142. K. I. Inglis, ‘Tasmanians in the Federal Ministries, 1901–1911’, THRAPP, vol. 15, November 1967, pp. 50, 53–54; Quentin Beresford, ‘Keating, John Henry’, ADB, vol. 9; Letter, Keating to Andrew Inglis Clark, 1 July 1905, Clark Papers, C4/C222, University of Tasmania Archives; CPD, 6 September 1907, pp. 2953, 2957, 24 August 1905, pp. 1425–1432, 20 November 1940, p. 14; Letter, Keating to Sir Josiah Symon, 27 November 1932, Symon Papers, 1736/1/5317, NLA; CPD, 9 August 1907, pp. 1707, 1712, 19 July 1907, pp. 763–766, 20 May 1908, p. 11218; Reid and Forrest, Australia’s Commonwealth Parliament, pp. 259, 298. CPD, 5 March 1917, p. 10960; SMH, 16 February 1924, p. 16; Geoffrey Sawer, Australian Federal Politics and Law 1901–1929, MUP, Carlton, Vic., 1956, p. 130–131; Robson, A History of Tasmania, p. 330; Ernest Scott, Australia During the War, A & R, Sydney, 1943, pp. 380–384; CPD, 5 March 1917, pp. 10961–10962, 13 March 1917, pp. 11217, 11268. CPD, 31 August 1915, pp. 6316–6321, 22 October 1919, pp. 13694–13699, 10 December 1921, pp. 14280–14281; Reid and Forrest, Australia’s Commonwealth Parliament, p. 213. CPD, 14 March 1923, p. 3561, 11 November 1915, p. 7459; Robert Randolph Garran, Prosper the Commonwealth, A & R, Sydney, 1958, pp. 200–202; Letter, Keating to Sir Josiah Symon, 27 November 1932, Symon Papers, MS 1736/1/5317–8, NLA; CPP, Report of the royal commission on performing rights, 1933. John Reynolds, Edmund Barton, p. 176;Letters, Keating to Sir Josiah Symon, 21, 31 March 1924, Symon Papers, MS 1736/1/2705, 2707, NLA; Up North: A Woman’s Journey through Tropical Queensland, [Queensland Government] Intelligence and Tourist Bureau, [Brisbane, 1912]; Letter, Keating to Sir Josiah Symon, 27 November 1932, Symon Papers, MS 1736/1/5317–8, NLA; Examiner (Launceston), 30 October 1939, p. 6; Canberra Times, 22 September 1996, p. 4; Argus (Melbourne), 1 November 1940, p. 2; SMH, 1 November 1940, p. 11; Mercury (Hobart), 1 November 1940, p. 3. This biography was first published in The Biographical Dictionary of the Australian Senate, vol. 1, 1901-1929, Melbourne University Press, Carlton South, Vic., 2000, pp. 231-236.